Lucky Day: You dirt-eating piece of slime! You scum-sucking pig! You son of a motherless goat! Q: Is the screenplay available online? Q: What does "el Guapo" mean? The spaghetti western meets the three stooges. 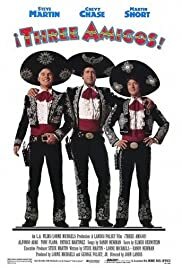 Martin, Short and Chase deliver one of their most memorable performances as three out of work actors hired, unwittingly, to be real gun fighters. These three comic greats work with a beautiful chemistry, to make you laugh hard enough to split your pants, every time you watch this movie. One scene rolls, painlessly, into another without making you look at your watch once as The Three Amigos attempt to stop the evil banditos (grungy, greasy, cavorting, drinking and shooting at everything - just as in the spaghetti westerns, but with a sillier and lighter edge versus a serious and menacing one) from taking advantage of the poor peasants. This is a classic comic film, with real comics pulling out all the stops, that I feel everyone should see. Guaranteed to make everyone laugh!